It’s characterized by abdominal pain that often radiates from the back, vomiting, nausea and malabsorption. Diet plays an important role in the treatment and management of pancreatitis. This article explains what pancreatitis is, what causes it and which foods you should eat or avoid on a pancreatitis diet. The pancreas is an organ that sits behind the stomach. It secretes important enzymes and hormones that help you digest food and regulate blood sugar. Proteases: These break proteins into smaller components called amino acids. The two major pancreatic proteases are trypsin and chymotrypsin. Pancreatic lipase: This enzyme breaks down dietary fats into smaller components called monoglycerides and free fatty acids. Amylase: This enzyme breaks down carbohydrates into smaller sugar molecules. Insulin: This hormone lowers blood sugar by transporting glucose from your blood into your cells for energy and storage. Glucagon: This hormone increases blood sugar by stimulating your body to release stored glucose into your blood. Pancreatitis is inflammation of the pancreas that occurs in response to injury. Acute pancreatitis is one of the most common reasons for hospital admissions. It occurs abruptly, is short term and usually only lasts a few days. The most common causes of acute pancreatitis are gallstones and binge alcohol consumption (1). Gallstones are small, solid masses that form from bile. If large enough, they block the bile duct causing a backup of enzymes or bile. Consequently, this blockage can lead to acute pancreatitis. In most cases, gallstones are not preventable but maintaining a healthy weight, following a healthy dietary pattern and exercising can help reduce your risk (2, 3). Chronic pancreatitis is long-lasting and can cause permanent health damage. It interferes with normal digestion and nutrient absorption, which can increase the risk of malnutrition. The most common cause of chronic pancreatitis is long-term alcohol abuse (4). Metabolizing large amounts of alcohol produces harmful molecules called reactive oxygen species, that over time, damage cells of the pancreases causing chronic inflammation and scarring (5). People with pancreatitis caused by alcoholism are at the greatest risk for developing refeeding syndrome, an adverse response that occurs when malnourished people being to eat again. The nutritional recommendations for pancreatitis differ depending on its severity and whether it’s acute or chronic. Acute pancreatitis can vary from mild to severe. In mild to moderate cases you may be placed NPO (nil per os, or nothing by mouth) to allow for your pancreas to rest and reduce inflammation. As symptoms subside, your diet may be advanced to a clear liquid diet followed by a low-fat, solid diet. Research, however, has increasingly shown that people with mild to moderate acute pancreatitis tolerate a solid diet just as well as a clear liquid diet (6, 7, 8). If you have severe acute pancreatitis, enteral nutrition support (tube feeding) is recommended within 24 — 48 hours of admission to improve health outcomes (9). You may require parenteral nutrition (intravenous nutrition) if there are complications with enteral nutrition or if your nutrition needs cannot be met by enteral nutrition or oral intake. If you have chronic pancreatitis, consume a regular diet with the highest amount of fat that does not cause an increase in abdominal pain or malabsorption. Symptoms of malnutrition include feelings of indigestion, foul smelling gas or stools, floating or greasy stools, frequent or loose stools as well as unintended weight loss. Taking pancreatic enzymes with meals and snacks can help improve digestion and absorption of food. You can get pancreatic enzymes over-the-counter or through a prescription from your doctor. It’s necessary to avoid consuming alcohol in any amount to reduce complications of chronic pancreatitis. Limit the amount of fat you eat to 25 — 35% of your total calories. This percentage represents 50 to 75 grams of fat per day for the average person. Grains: Whole-grain breads, cereals and pastas, brown rice, and low-fat crackers or pretzels. Protein: Lean cuts of beef and pork (loin, round, extra-lean hamburger), skinless poultry and fish. 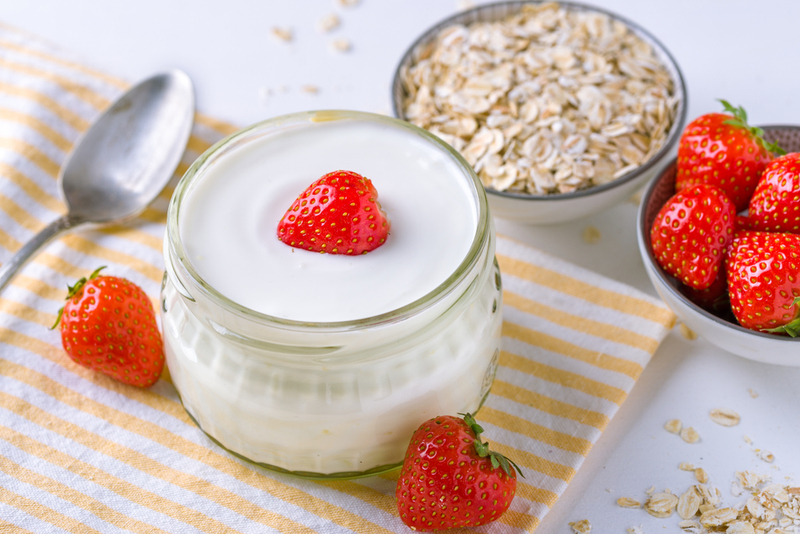 Dairy: Fat-free (skim) or low-fat (1%) milk, yogurt or cottage cheese. Fruits and vegetables: Fresh, frozen or canned fruits and vegetables. Fats and oils (use sparingly): Olive oil, canola oil, soft or liquid margarine and vegetable oil spreads. Grains: High-fat bakery products, such as doughnuts, biscuits, pies and cookies. Protein: Higher-fat cuts of meat (ribs, T-bone steak, regular hamburger), bacon, sausage, cold cuts and hot dogs. Dairy: Whole and reduced-fat (2%) milk, ice cream, cream cheese and sour cream. Fruits and vegetables: Fruit serviced with cream, and vegetables prepared with cheese or cream sauce. Fats and oils: Butter, stick margarine, shortening and coconut or palm oil. Pancreatitis occurs when your pancreas becomes inflamed. It varies in severity and may be classified as acute or chronic. With acute pancreatitis you may be placed NPO and then advanced to a clear liquid or solid food diet as symptoms improve. In cases of chronic pancreatitis, you may need to supplement with pancreatic enzymes or follow a low-fat diet. You should abstain from alcohol completely if you have pancreatitis to limit further complications.